Starbucks Gossip: OPEN THREAD conversation starter: Perv customers -- how big of a problem are they at your store? OPEN THREAD conversation starter: Perv customers -- how big of a problem are they at your store? At a Chicago Starbucks store, a 42-year-old man fondled himself while staring at female customers. He was arrested after another customer caught the pervy behavior on his cell phone video camera. Have any similar stories to share? Discuss this, or anything else Starbucks-related in the weekend open thread. || Jump to the second page of comments. We have an old man who comes in every Saturday morning and always grabs our hand when we take his money or give him his change. We hate serving him. It probably doesn't sound a big deal but it's really unpleasant. A man at a store I used to work out would always come in when it was slow and talk to me. For months I thought he was just a typical lonely guy who needed someone to talk to now and then about random stuff, his kid, the latest news, cats anything. One day he slipped me a card and on the back was written his cell phone number along with a message to call him...I knew he was a laywer and he new just how to word it without actually saying it. Needless to say I never called being that I was 17 at the time and he was 46!! He never came in after that. Every single one of the stores I have worked at (half a dozen) have been perv central. My SM actually tries to avoid hiring really attractive female baristas because of the customers they attract. We even caught one old dude masturbating in the bathroom. Foul. Oh honey man... Last month we had to call the cops and fill out an incident report after a guy exposed himself to a couple of girls sitting in lobby. Time to slip some saltpeter in the paninis? I used to love it(being a male barista) when some perv would come in to hit on my attractive coworkers. As soon as they saw them getting out of their cars, if they were on reg I'd hop on for a second, deal with the scumbag, let them take back over. We've had some of our barista's stalked by particular people, pretty scary. My advice is to not be nice to these people. I know it sounds mean but, you can't encourage them or they WILL be back. I wish we could still tie and quarter these morons. That'd teach em. Honey man orders zen tea, asks for honey packets,and then proceeds to the mens room and eventually leaves a pile of honey and DNA on the rest room floor. He has been banned from every Starbucks in the metro Boston area. A man told me yesterday that he "likes his lattes like he likes his women; skinny and extra hot" and then winked at me. The honey man! LOL! I forgot all about him. Is he still trying to get into stores? We have a few pervs. One is a man about 80 who insists on kissing (YES KISSING!) - on the cheek all female staff who are present. Not our store manageress, she won't stand for it. We have a man who makes comments about how the female partners look. We have a man who tries to find out where we socialise after work. Another man with special needs who stares at us every day. The funny thing is their names all begin with G! there used to be a homeless guy who would come into 444 in chicago and would sit there and spread his legs for people. his crotch of his pants were gone and he wore no underwear. totally nasty. I've been lucky i guess, i've never felt uncomfortable around any of my customers, or felt i was being hit on. I have on customers who makes comments like "hey hot stuff" but he's totally tame, he's always with his wife and dogs, and really he's actually funny and cares about all the baristas, so it's not bad. Not to change the subject but it is weekend open. 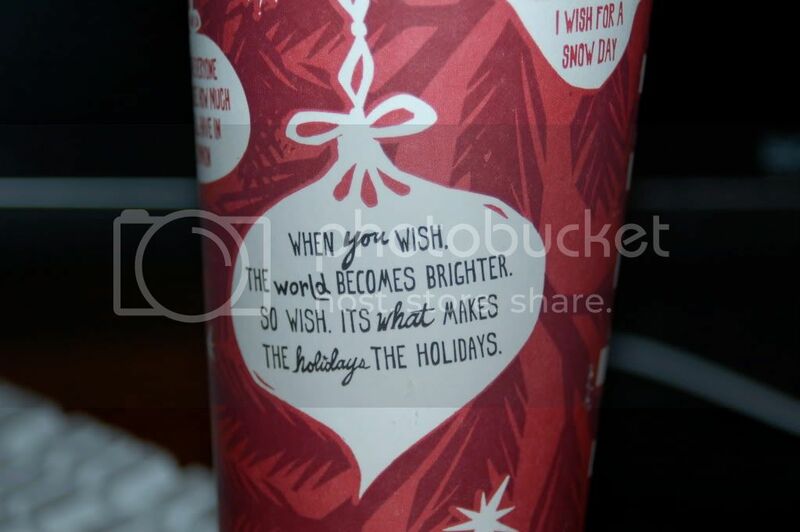 Anyone else notice the typo on the holiday Venti cups, HOL110-06514 ? Is it on all of these cups around the country? ITS is a possessive pronoun where IT'S is a contraction for it is or it has. I have been a long term fan of Starbucks and recently I have had nothing but bad experiences and it is really souring me to the whole brand. I ordered a decaf skinny latte and the barista rudely commented about my drink order being "no fun". I can take a joke but the tone of his voice was so annoyed and it was not directed to me but the fellow barista. I wanted to buy a small frappacino bottle to bring home for later and was bluntly told, "WHY WOULD WE SELL THAT WHEN WE CAN MAKE THEM FRESH?! GO TO THE WALGREENS TO GET IT!" Sorry but I have seen them in EVERY Starbucks as far back as I can remember and I still see them - so I guess this store manager decided not to carry them? I don't know - I know it is a minor thing but why make me feel stupid for asking about it. FInally, I saw a barista give his mother a free drink (well charged her for a refill only) which I can understand even though its sort of stealing, but then when the other barista was not making it quick enough he went from the register, took over, and treated her badly. Anyway - needed to get it off my chest. So many baristas do a great job and I am thankful but I guess it is human nature to remember the negative experiences more strongly. Seems to me in a bad economy Starbucks should be able to find some better staff and get rid of the bad apples. Again, sorry to be negative and so many baristas do a great job - but I just need to vent and start fresh with one of my small pleasures in life. I have been a Starbucks customer since 2003 and I have always had a good experience. Any gold card holders notice a bug in the my rewards page in your online account? I've earned 0 stars so far. When you click "my rewards", it shows a big "15" where it says "STARS YOU'VE EARNED:15 You need 15 more stars to earn your next free drink". Then the page refreshes itself to show the actual stars I've earned: "STARS YOU'VE EARNED: 0 You need 15 more stars to earn your next free drink". @Sbux customer: Yes mine has a bug in it too. When I first log on and go to that part of the site it says I have earned 14 stars. After a second or 2 it goes away and then says I have 3 stars (which is how many transactions I've had since the 6th). I don't know why the other # sticks there though. Is that like what you are explaining? Is anyone aware of any sites or groups (not eBay!!) where people have Starbucks cards they are willing to trade or sell? There are a few older designs that I don't really think are super rare that I would like to have. I would like them to be in fairly new or new condition. Hayley, what are you looking for? I have a good collection! I don't know where I'd send you to trade with others, though. We have a guy who comes in to get a tall coffee in a grande cup, double cupped with no sleeve, every.. single.. morning. so when I open, I turn and get the coffee without saying anything to him because he's silent most of the time anyway besides the creepy winking. The other day I had his coffee ready before he walked in the door, and he asks, "so when are you moving in?" EW! Hayley, yes, that seems like the same experience I am having. Something similar has happened to me before although I was a customer and the guy was sitting next to me when he started touching himself. He was much older and I wondered if he was "all there". I didn't freak out but I moved seats really quickly. Gold Card holders....if you previously held a gold card (the black one) and it was registered...you were transferred into the new "gold level" when they sent you the new actual gold colored gold card so you've earned 15 stars to get to that elite level already but not actually purchased 15 stars worth of drinks....pick up a brochure on the front of any register at any Starbucks this weekend it will explain it better with a nice little diagram. It is probabky a perk so less customers wpuld be upset about losing the 10% off if they put you halfway there to earning free drinks! Everyone else who starts with a registered card has to buy 30 beverages first. I believe you mean "Draw and Quarter"
I'm interested to hear about customers asking out baristas! Have any romances developed?? The Happy Birthday one that has the cup with the candles in it that they only released in Indianapolis. I was also looking for the red comfy chair one in really good condition, the one that used to be the core card. For the poster who mentioned the customer who kisses female employees--why do the starbucks managers tolerate this behavior? If you are responding to Hayley and I, thats not what we are experiencing. Starbucks did not give us 15 stars free in the transition. It is just a bug that displays 15 stars and then goes away after a second and then displays the actual stars we have. Honesly Vivavia, the women get hit on/asked out all the time. I've had about 95% of my female co-workers over the years tell me they are numb to it when they walk in to work. I've known one female co-worker that dated a customer. That over five stores in six years. The guys, another story. They are more receptive to customer advances and I'd say I've known about ten male baristas that have dated customers. A few turned in to long term relationships. The most common seems to be somebody picking up a shift at another store and meeting somebody working at that store or customers picking each other up. Romance doesn't seem to cross the counter very often. A former barista of mine started dating an older customer when I first took over my store..within 2 months he was paying her rent and buying her jewelry..she left the company about 5 years ago and just recently left him after asking him to lend her money to repair a "friends" car. Gentlemen..please don't hit on your baristas..it only gives us something to talk about and makes you look foolish. I disagree, javagirl666! Well, maybe I agree with the hitting on like at a bar, but I think that if you sense a certain chemistry with a barista you should ask them out! Go for it!! Back in the day when Starbucks was still somewhat of a novelty, and lattes were still largely seen as indulgent treats, someone who ordered a decaf skinny latte would have their beverage teasingly referred to as a "no fun latte" (i.e. no caffeine, low-calorie). Your barista most likely meant no disrespect. They've probably been slinging espresso for a long time. I used to work at a store located in an Asian mall. My SM was fairly biased, and he liked hiring Asian baristas because the large majority of our customers couldn't speak English, and so we could still communicate with them. It was a marketing ploy, and while it was not ideal it was very effective. About half of our baristas at the time were young (18-25), pretty, Asian females. There would be a horde of men from mainland China who sit in our cafe area and just stare all day long. It is surpremely uncomfortable. Our manager didn't speak Chinese, but I did, and it is unsettling to hear them talking about us and making tons and tons of misogynistic comments. Now I'm Chinese myself, and I understand that much of rural China is still very, very much explicitly patriarchal. But this is Canada, not China, and having grown up in North America it irritated me. Whenever I was bussing, they would just stare non-stop. They did this to all the Asian girls in our store. They made comments like "Do you want to be my wife and clean my house for me?" and "You're cleaning, that's good. That's where you belong". When they found out that a lot of us were in university (post-secondary education for females is quite uncommon in rural China), they started chatting audibly amongst themselves how bad Canada is that girls are in school, instead of serving their husbands. They did a lot of other irritating stuff, like deliberately spilling a cup of coffee right in the middle of their group (they came in groups of around 8-10 men), and yelling for one of the girls on shift to clean it up. Then while we were mopping they would trashtalk how we were mopping wrong, and staring at our backsides when we bent to pick stuff up. Sometimes when the backroom was full, we would have to eat our meals in the lobby area. Whenever a girl barista is eating, they would start yelling at her to stop eating or she'd be fat, and no man would want to marry her and then she would be useless. It was disgusting, absolutely disgusting. That's the problem (at least for the female baristas). Most men don't seem to be able to seperate real signals from the friendliness that we are paid for. It's almost like they don't hear us asking every customer about their day, or notice that we are smiling at every customer, or making eye contact with every customer we talk to. I'd say 99 times out of 100, a guy who thinks his barista likes him, is just geting good service. That is just flat out WRONG. You should not have to put up with that kind of nonsense. As your coworker and as an adult male, I would have no problem addressing those groups of men and even asking them to leave the store. Would we lose some business? I don't care. Could I be fired for getting in their face? I don't care. Right is right and wrong is wrong. People should not behave like that. When we get a creeper in our store, my female coworkers know that they can count on me to run interference. If they give me 'the look', I know to tell them they have a phone call in the back and I instantly take over for them. And if I get in trouble for getting in someone's face - I DON'T CARE. @Sbux customer - the 15-star thing isn't really a bug. I'm still on green level, what happens is that my prior star balance shows up when I immediately log in, but the screen automatically refreshes itself after a few seconds to what the actual balance is. It's a function of it searching for real-time info from the syetm. Just like when you have to manually refresh your card balance info to get the latest. Not really a problem as long as your updated result is accurate. Not really a gold-card only thing. Got my W-2 yesterday! Wow Starbucks is super fast this year! I agree! That's so awful! It is disgraceful to tell women to not eat or they'll get fat, i dont know how you or any one else deals with that. I would love to come to canada an kick their butts! I'm a bit confused about my cards. I have a regular starbucks card that has money on it that was given as a gift to me I've been using since Christmas, and I have a gold card which expires (according to starbucks site) on 12/23/2010. I have been using the gift card to pay and having the gold card swiped for my discount. Since the gold card won't expire for almost a year, I guess they won't be sending me a new rewards card at the gold level until then, and I'll just keep using my 10% discount. But with the other card I use, which is a regular starbucks giftcard, shouldn't the site show that I am accruing reward stars? Or will it only let me use one program at a time? If that is the case I have little motivation to reload that card, and will just keep using the discount card only with my credit card for the time being. Because you are still on the gold card program, you will not earn stars until your gold membership expires. If you don't want to use the 10% discount anymore and you want to start earning stars and be in the gold level of the new rewards program, you can call Starbucks at the number on their website and they will end your membership so that you can start using the new rewards program. Wished Starbucks would make it harder to get the gold level and give better rewards at the gold level. For someone like me who only visits Starbucks once or twice a month, it will take a while before I earn 30 stars to get to or maintain the gold level. But for a regular who visits everyday, earning stars will be really quick. If a customer visits 7 days a week, it would only take a month to get to or maintain the gold level. Now if the customer purchase two items and have it ring up separately on each visit, he or she could earn the gold level in half a month. I had to call the police today and report a customer. Five years ago this very site reported on StarbucksCards.com, which no longer seems to exist. It was a resource for card collectors. Hey for partners or sm's .. My SM has informed us that we have to put an actual time on anything we day dot now. And we have to write on dots what it is? Anyone know if this is the case? One morning, before dawn, I looked up from the bar and saw in line a man wearing tiny 70's shorts (you know the kind) - only he was now in his 50's with accompanying scrawny legs and the shorts were way too small and left nothing to the imagination. But he was wearing them quite nonchalantly. I made eye contact with my barista on reg, and we both lost it. I turned my back and kept laughing, but trying not too, so all my co-worker saw was my shaking shoulders which made it harder for her not to laugh. After all the customers were gone, I found out that "shorts guy" had, upon reaching the register, placed his entire package on the counter and left it there while she helped him, all the time acting as if it wasn't happening. I don't know if the guy was a perv, but he was certainly weird and creepy! Marcus, you could sign up for another card account and use both cards at the same time. Just don't register them under the same cards account and you'll be fine. @liz, we've always been supposed to put a time on the day dots. At my store we have the agreement to not time it if it is closing. Otherwise, timing is important, especially for all those 24 hour items. We never write the name of the item onto the sticker. Why should we, it's already attached to the item in question, isnt't it? NYC health department closes a Starbucks store for the weekend Do any baristas/customers from this 86th and Columbus store -- or other NYC Starbucks stores -- have details about the temporary closing? Rat feces problem? Warm milk? Do tell! || Read "Dept. of Health takes out Starbucks for entire weekend"